Hiking may be Warren County's favorite sport. Certainly the county offers the largest variety of hikes in New Jersey, including a panorama of magnificent vistas, intriguing history, and abundant wildlife. Difficulty: You should be in shape to enjoy this walk, which is tough due to rise in elevation. Length: Rises 900 feet in 1.8 miles to Mohican Rd. Trailhead: Located in the Delaware Water Gap National Recreation Area, the trail, marked with red blazes, begins across from the Coppermines parking lot on Old Mine Road before the entrance to Worthington State Park. Warren County hikers are consistently rewarded with visible reminders of a busy past, sometimes in remote tracts high in the hills. The rigorous climb to the Coppermines in the Kittatinny Mountains is well worth it. The trail starts at site of former Boy Scout camp that occupied buildings of former failed copper mining operations. The tract contains remains of at least 17 mining shafts and tunnels from various historic periods beginning in the early 1700s. Some openings are large, some very small. Look for foundations of mill buildings and the railroad cut in the outcropping high above the trail where an early 1900s narrow-gauge funicular railroad brought raw ore from a large strip mine on the mountain above to the mill below. Follow the red blazes past the very large stone foundation of the old copper ore mill, up the mountain. The trail climbs very steeply as it leads along the upper edge of the ravine. After a few hundred yards, pass by an old mining road called the Kaiser trail which, if followed, will lead to the large strip mine diggings and associated talus heaps further up. It will then lead to the top of Kittatinny Mountain and the Appalachian Trail. Staying on the Coppermines Trail will lead you past another large mine opening on the right, called by many "the upper mine". This opening has become unstable and a pile of earth and rock has been placed in front of it to discourage exploration. 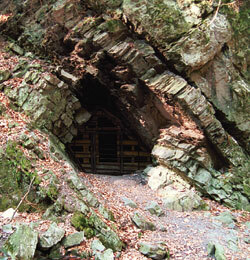 There are a few small mine shafts further up the mountain, starting directly above the "upper mine". Getting to these can involve treacherous maneuvering on the rocks above. The trail continues past the upper mine through beautifully rugged scenery along the upper edge of the ravine. Gaze down into the ravine on the left below, looking for possible small ancient primitive diggings (called "Indian mines" by some) or animal dens located in the rocky sides of the ravine. The trail ends near where the AT crosses the road leading to the Mohican Outdoor Center. Difficulty: The Red Dot is challenging, due to rocky trail conditions and a rapid rise in elevation. Hikers must be in good physical condition and willing to hike over large rocks and boulders. Care must be taken during warmer weather to avoid rattlesnakes, often present among the rocks. Length: The trail rises 1200 feet in 1.5 miles to top of Mt. Tammany, 3 or 4 miles total depending on return route. Trailhead: The Worthington State Park trail, marked by red blazes in a white circle, begins at the Dunnfield parking area on I-80 West just before the last exit in New Jersey. The Red Dot Trail can also be accessed from the small picnic/rest area located just before the Dunnfield parking area on I-80. The rugged Red Dot trail to a magnificent vista from the top of Mt. Tammany at the Delaware Water Gap is equally rewarding. The climb up the Red Dot to the summit of Mt. Tammany on the NJ side of the Delaware Water Gap involves traversing rocks and boulders. The trail begins its sharp rise immediately via a series of timber-and-rock stairs. The steady ascent approaches an overlook high over I-80 and the Delaware River a few hundred feet below cliffs that drop nearly straight down. The trail heads a short distance away from the cliffs for a while, going through a very wet, rocky area, near the base of a very steep, rocky climb, probably the most difficult of the hike. At a few places here, you can tell where the "trail" is only by looking for the blaze marks painted on the rock surface. The trail again traverses woods until it reaches the open, rocky summit of Mt. Tammany, 1549 feet above sea level. By carefully maneuvering down the bare rocky slope at the top, you will get a most spectacular view to the north, west, and south. Chances are excellent that vultures, hawks, and occasional eagles will be soaring below you. Enjoy it. An alternate return route brings you down the Blue Dot, over a wider, gentler route that merges with the white blazed Appalachian Trail a short distance from the Dunnfield parking area. Difficulty: Moderate to difficult, due to steepness of elevation rise over relatively short distance. Length: The trail rises 980 feet in just over 2 miles to Sunfish Pond. Trailhead: Park in the lot along Old Mine Road one mile north of the entrance to Worthington SP headquarters. Follow the blue-blazed Douglas Trail upward. The Douglas Trail is named for U.S. Supreme Court Justice William O. Douglas who accompanied more than 1,000 people in a 1967 public protest hike organized by Casey Kays and the Lenni Lenape League to help draw attention to the plight of Sunfish Pond at the hands of politicians and power companies. Sunfish Pond is a natural glacier lake formed thousands of years ago atop the Kittatinny Ridge. The pond is deep enough that at one time local tradition claimed that it was bottomless! Less than one mile to the east of Sunfish Pond is a reservoir constructed in the 1960s as part of the Yards Creek Pumped Storage Facility. For many years Sunfish Pond has been unable to sustain any number of fish other than of scant proportion in both population and size. Attempts to stock Sunfish Pond from 1943 to the 1970s underline the lack of environmental understanding of that era. In 1960 the State of New Jersey intentionally poisoned of all of the lake's fish in a misguided attempt to "reclaim" the lake so that trout, to be stocked later, would have a better chance of survival. The trail heads up the mountain diagonally using switchbacks to cut down on the grade. At the third switchback above the junction of the two trails, an old road branches off to the right. Not too far to the right is the old terracotta pipeline that Charles Worthington had constructed in 1912 to bring water from Sunfish Pond down the mountain, under the Delaware River to his mansion at Shawnee, PA. Worthington was a prominent turn-of-the-century industrialist and landowner for whom the state park is named. A short distance after this switchback, near Backpacker Site #2, the Douglas Trail meets the Appalachian Trail, which should be followed northerly to Sunfish Pond. The backpacker's site is one of only two designated camping sites on this portion of the mountain. During the 1960s and early 1970s so many people were drawn to the beauty and "isolation" of this area near Sunfish Pond that the surrounding natural area was quickly trashed. Strict control needed to be placed over the area in an attempt to keep it in its natural state. Plan to spend time exploring the rocky shoreline of Sunfish Pond and sitting on one of the hundreds of huge boulders to eat a picnic lunch. While admiring the lake and surrounding shoreline, think about old folk lore that claims a Lenni Lenape Indian chief was carried up here to be buried, somewhere in a natural rocky vault. Evidence of this burial has not been located... maybe it's still there. Despite the lack of fish, it is not unusual to see beavers swimming along the surface of Sunfish Pond from time to time. Look for signs of beavers here, such as gnawed sapling stumps or brush piles just offshore. Difficulty: Easy, due to very little change in elevation and a well maintained trail. As usual on any wooded trail, runners will need to look for roots and rocks in the trail. Trailhead: Merrill Creek Reservoir is located on top of Scotts Mountain, also known as Montana Mountain, in Harmony. Park at Visitor Center on Merrill Creek Road and get a trail map. A pristine scene along the shores of Merrill Creek Reservoir is punctuated by a pair of nesting eagles perched high in the tree tops. Bring binoculars along for spotting distant wildlife such as birds, deer, squirrels, chipmunks, or occasional bears. Various trails link the Visitor Center to the circumference trail that loops around the reservoir. Traveling counterclockwise around the reservoir, you will first hike through the trail complex until you finally cross Merrill Creek, the namesake of the entire reservoir. Now you are out of the trail complex and on the loop trail. The trail skirts the reservoir's northern shoreline, passing dozens of bare, skeletal "drowned trees", great shelter for fish. Ospreys, and even eagles, perch on the dead trees, surveying the reservoir for fish. The trail emerges from the woods and passes over the top of the first of three dikes blasted out of the bedrock during the construction of reservoir. After walking a short distance, the trail crosses a large flat "field", constructed to be the spillway for the reservoir. Many nice wildflowers and butterflies may be seen here during the warm seasons. As you cross this area, look back and you will see the Delaware Water Gap to the north and Wind Gap to the northwest. The trail turns left at the end of the spillway and crosses the parking lot for the inlet/outlet tower, one of the best vantage places on the reservoir, offering tranquil panoramic views of the reservoir and the Delaware Valley below. This is where bird watchers gather to watch the fall hawk migration, and eagles year round. In the winter, this is a great place to observe the various species of ducks that gather in open, unfrozen sections of water. Some years, many thousands of Canada geese and Snow geese gather here, offering spectacular views as the huge flocks take off, circle overhead, and then land again. From the parking lot, the trail crosses the second dike, entering the woods at the other end. A trail merges from the left, coming up from the reservoir shoreline and leading to an observation platform along the shoreline from which the first eagle's nest can be seen. 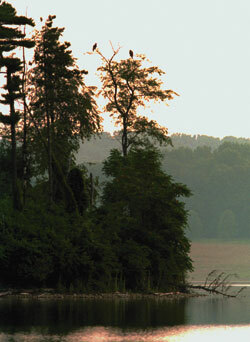 The reservoir hosts a pair of resident bald eagles. Over the past few years they have raised at least 6 young eagles and have had nests at two different locations, the latest nest being in plain view from the inlet/outlet parking lot. The circumference trail emerges from the woods, leading down to the top of the main dam. After crossing the dam, the trail leads through more woods, some open shoreline, and the southeast dike. After a short walk, the trail leads to the parking lot for the boat ramp. Across the parking lot, the trail leads upward a short distance then back to the visitor center where it started. Make sure to bring binoculars along on the hike. On the land, they will be helpful in spotting distant wildlife such as deer, squirrels, chipmunks, or even occasional bears. Along the shore or over the reservoir, binoculars help to see ospreys and eagles as they search for fish, various gulls, ducks, loons, grebes, and other birds. The types of birds seen here will vary with the season, although the eagles are here year round. Some of the rare or unusual birds seen here are snowy owl, pacific loon, sabine's gull, redhead duck, barrows golden eye, crossbills, pine grosbeak, bald and golden eagle, goshawk, cliff swallow, red necked grebe, rough legged hawk, peregrine falcon. Located in Jenny Jump State Park, these small interesting caves are a short distance from the dirt parking lot at Ghost Lake on Shades of Death Road, about 2 miles east of intersection with Hope-Great Meadows Road (County Rt. 611). Evidence of Indian occupation has been found at the Faery Hole in Jenny Jump State Park, including a few pieces of pottery and evidence of a firepit near the opening. From parking lot follow the rocky but easy trail along the lake's edge about 200 yards, then a short scramble up a steep rocky slope to the cave known as Faery Hole. About 10 feet wide and 15 feet deep, the floor is flat and the roof high enough to allow most people to stand up comfortably. A natural "chimney" in the rear of cave sometimes contains blind cave cricket. Do not harm them. Scant evidence of Indian occupation has been found here, including a few pieces of pottery and evidence of a firepit near the opening. When the cave was excavated in the 1930s by state archaeologist Dorothy Cross, thousands of mammal bones and fragments were recovered, among them the tooth of a giant beaver, now extinct. Although no established trails lead to it, the diligent explorer can find Fairly Low Cave a few hundred yards northeast of the Faery Hole. 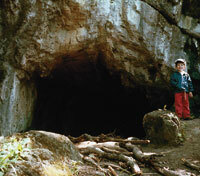 This cave faces east, about halfway up the steep rear wall of a cirque (steeply rounded area.) The cave is about 3' high x 4' wide x 160' long and contains a series of 3 or 4 very low "rooms". Standing up in this cave is not possible, and the only way to explore this cave is to crawl. Be careful of broken glass. While you're at Jenny Jump, take a stroll about fifty yards northwest of the park's headquarters to an obvious cavity in the rock outcropping. A few Indian artifacts were found here including pieces of pottery, arrowheads and indications of a fire pit. It is believed that the shelter was occupied infrequently, probably due to the lack of convenient water. A total 15 miles of trails traverse the Allamuchy Natural Area. A good one for a family with grade school children is the White Trail, leaving from parking lot #2 at the end of Deer Park Road. Take a left hand turn off Route 517 heading south from Route 80 exit 12, a few hundred yards past Panther Valley. The Allamuchy Mountain State Park entrance is about a mile up the narrow gravel road. Rutherfurd Stuyvesant bought most of the farms here at the turn of twentieth century, increasing his ancestral estate to 5,000 acres and establishing Deer Park, a 1,000 acre private game preserve on Allamuchy Mountain. Fencing surrounded the entire section, remnants of which can still be found in today's Allamuchy Natural Area. There are two-dozen fields maintained to show succession of a mixed hardwood forest, ranging from recently cleared to forest undisturbed for 75 years, including oak, maple hickory and birch. Just beyond the gate of lot #2 the White Trail begins a gentle 4-mile loop over rolling terrain. It passes bedrock outcropping on the left where the hardwood forest gives way to grasses and shrubs. Along here an iron pipe crosses the trail by which Stuyvesant pulled water from Deer Park Pond to supply his estate. The trail then starts down a gentle grade, and traffic noise from Interstate 80 starts to replace the birdcalls and woodpecker taps. About a mile and a half from the start a spur trail takes off to the left. There is no sign here but the trail crosses an old fence line, then leads to a Scenic Area off of eastbound Interstate 80, once suggested by Lady Bird Johnson to be one of the best vistas in New Jersey. Back at the White Trail, turn left off the spur until the trail dead-ends with another trail. Follow to the right as the White Trail continues towards Deer Park Pond and intersects a woods road by the water's shore. Deer Park Pond, sitting high above the fray of interstate transport, offers peaceful reward to the casual forest wanderer. If you have questions or comments about these and other outdoor destinations in Warren County, please e-mail Bob. You can also check out a more complete catalog of Koppenhaver’s photos online.